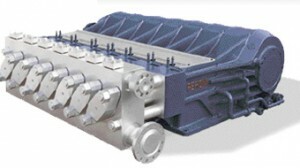 The pumps of PTO-PQO-PSO series comply with API 674 and ASME standards and are specifically designed and manufactured for process applications where continuous heavy duties are involved demanding the highest operating reliability and the longest maintenance intervals.The pumps of this series are made in horizontal execution, a solution providing several advantages if compared with the vertical one and which has been chosen by Peroni since the mid 60’s, when the production of vertical pumps was basically discontinued. The series includes two pump sizes, 160 and 190. For each size triplex and quintuplex versions are available together with a septuplex model for the 190 size. The multiplunger solution allows better design optimisation as the number of pump sizes necessary to cover the performance range is minimised and the number of different components required to manufacture the whole series is reduced to the minimum, increasing the field experience on the single parts. Quintuplex or septuplex pumps, compared with a triplex pump of equivalent performances, have reduced static and dynamic loads and pressure pulsations which simplifies pipe design. It results higher reliability, less maintenance and smoother operation of the pump.